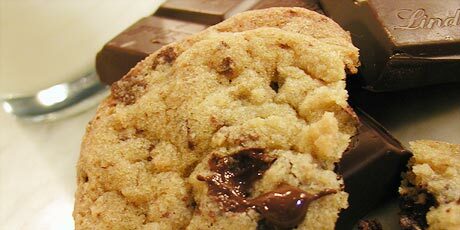 For a more decadent cookie, use 2 cups of chocolate chunks! Always remember the better the quality of chocolate, the better the cookie! 2. Line 2-3 baking sheets with parchment paper. 3. Sift the flour, salt and baking soda into a medium size bowl. Set aside. 4. In the bowl of a stand mixer fitted with the paddle attachment, (alternatively with an electric mixer) cream the butter with both sugars until light and fluffy. Scrape down sides. Add one egg at a time, scraping down the sides of the bowl after each egg. Add the vanilla. Careful not to over mix, add the flour mixture until just combined. Stir in the chocolate chunks. 5. Scoop out 1 tbsp. dollops of dough, roll them into balls. Put them on prepared baking sheets, 2-inches apart. Bake cookies, rotating the pans halfway through cooking time, until cookies are just golden, about 8 to 10 minutes. Let cool for 10 minutes if you can. Makes about 40 cookies.